Fix Your Business with Melinda Emerson, the "SmallBizLady"
Name: Fix Your Business with Melinda Emerson, the "SmallBizLady"
For nearly 20 years, Melinda Emerson, also known as the "SmallBizLady," has served as an international expert on small business development and social media marketing. As the founder and president of Quintessence Group, an award-winning marketing consulting firm based in Philadelphia, PA, she has worked with countless Fortune 500 brands who target small businesses. A few of her notable clients include Visa, Sam’s Club, FedEx, American Express, ADP, Verizon Wireless, Pitney Bowes, Staples and The Hartford. She has also been featured in national publications such as the New York Times, Black Enterprise, MSNBC, Fox News and CNBC as America’s number one small business expert. Join us from 6 p.m. to 9 p.m. February 21 at Pipeline Philly to learn how to fix your business. Melinda will discuss her latest book, Fix Your Business: A 90-Day Plan to Get Back Your Life and Remove Chaos From Your Business. 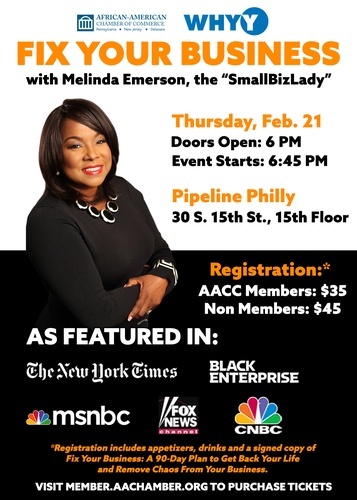 Tickets for AACC and Pipeline members are $35, and non-members are $45. Networking begins at 6 p.m. and the moderated discussion will begin at 6:45 p.m. There will be room for Q&A from the audience. This event will be moderated by Emmy award winning journalist Regina Mitchell, who is a co-host of WHYY-TV’s You Oughta Know, your guide to what’s happening in the greater Philadelphia region. Each Thursday at 7:30 p.m., Mitchell and co-host Shirley Min arm you with news, events, pop culture facts and consumer tips to make life a little better. Originally from Long Island, New York, Regina came to Philly to attend Temple University where she graduated with a degree in Broadcast Journalism and Theater. Her journalism career began at Philadelphia’s Fox 29 with subsequent appointments in Trenton, eastern Pennsylvania and Dayton, Ohio. She earned an Emmy for her reporting on at risk youth turning their lives around by creating music. While Regina was making her mark on TV, she was also pursuing her life passion in fitness by becoming a personal trainer and fitness class instructor. Regina now lives in Philadelphia were she still works as a personal trainer, and plant based nutrition coach. Registration includes appetizers, drinks and a signed copy of Fix Your Business. Please note that you must register by Thursday, February 14 to receive your book the date of the event. *Registration includes appetizers, drinks and a signed copy of Fix Your Business.